SmartCabinet™ is a new approach to providing a complete IT infrastructure solution that contains power, thermal management, enclosure, power distribution, monitoring and infrastructure management all in a simple packaged solution. It is a fully integrated, industry-leading plug-and-play solution with a ready to use IT rack space. It eliminates the need to build complex computer rooms which dramatically improves the speed of system deployment compared to the traditional approach. 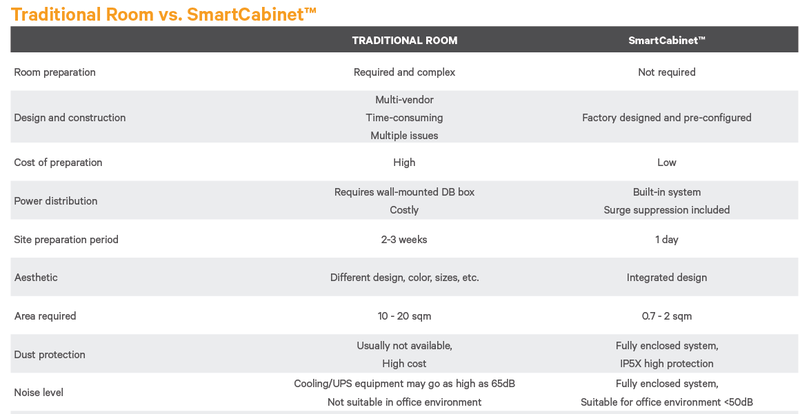 SmartCabinet™ is pre-configured, pre-installed, and factory tested to ensure system compatibility and is ready to use from day one. Low power consumption LED lights that automatically light up when door is opened. Built-in Power Management Unit (PMU) provides MCB to UPS, Cooling unit, PDU, and bypass. It also provides surge protection to SmartCabinet™. IT equipment and turn on emergency fans during power outages. Temperature sensors at front (cold aisle) and at rear (hot aisle) report critical environmental information and alarm users if exceeding configurable threshold. The door access sensors at front/rear report alarms on unauthorized access. Provides central management of SmartCabinet™ by monitoring power, thermal, environments, security, and providing user interface through touch panel LCD display. 5KVA On-line double conversion UPS and battery cabinet ensures clean power feeding to critical IT equipment. It also provides backup power to emergency fans during power outages. The thermal unit provides up to 3KW cooling capacity directly to IT equipment. Since SmartCabinet is fully sealed, the cool air will only use to cool down critical IT equipment with the highest efficiency. Two emergency fans automatically run during power outages ensuring continuous cooling capability. Water leak sensor provides additional security for critical IT equipment. Provide at-the-rack access to servers, making software upgrades, troubleshooting and system monitoring convenient and less time consuming. Providing secure and remote out-of-band connections to the servers and serial ports. This unified approach enables IT administrators a faster method to diagnose, configure or restore equipment to meet SLAs and minimize downtime. 15. Branch offices, retail stores, small & medium sized business offices, and telecommunication sites. 16. Branch locations for government, educational institutions, healthcare, finance, business process outsourcing firms.